To this day, there are some things that I still am slightly afraid to make. Things that seem complicated or things I’ve messed up on a few times in the past. For some reason, tortillas and I weren’t friends. I remember making flour tortillas and how much work they were and I honestly didn’t like how they turned out. So, on I went buying tortillas and feeling slightly guilty the whole time. I mean, it can’t be that hard to make a good tortilla. With some things, I’ll even go as far to buy all the ingredients I need but then use them for different purposes because I never got around to challenging myself (ice cream is a good example, but that is a story for a later date.) About a month ago I bought Masa Harina to make corn tortillas. There was a small chant happening in the back of my head, prepping me for my victory against tortillas. There was even encouragement from Kelsey (Happyolks.) I mean, if she can be in the midst of a major move and make tortillas, clearly I had no excuse. I’m proving to myself that certain things sold in the grocery store are much better homemade. Many times when I tackle making something, the first words out of my mouth are, “I’m never buying these again.” Each time I make something from scratch, it’s a small win against processed foods. Homemade corn tortillas are amazing. The store bought ones are dry and such a pain to use. Homemade? Soft and delicious. Plus, a bag of masa harina cost only three dollars and I’ll be making tortillas out of it for a few meals. Making foods at home that would normally be processed just takes time and patience. Once you accept that fact, you can really make anything you need and the flavor is always worth it. As for the filling, I’m on a lentil kick right now and I wanted to do a slight riff on mole seasonings but base it on what I had in the house. It’s slightly spicy which pairs nice with the greek yogurt. If you don’t like raw chard you could toss it with the lentils at the end of the cooking to slightly wilt the chard. Combine 1/8 teaspoon dried chiles, oregano, paprika, honey, and cocoa powder and set aside. Heat olive oil over medium heat. Add in onions, letting cook for 2-3 minutes. Stir in spice mixture along with honey, let cook for one minute. Add in lentils and 1 1/2 cups water, bring to a boil, then reduce to a simmer. Let lentils cook until tender but not mushy. If you find the lentils are still not tender and most the water has been absorbed, add in a bit more water to reach desired consistency. I will taste occasionally along the way to determine doneness and to determine if I need more dried chiles, salt, or honey. Lentils will cook anywhere from 25-35 minutes. If lentils are still not done but all the liquid has been absorbed, add a touch more water. 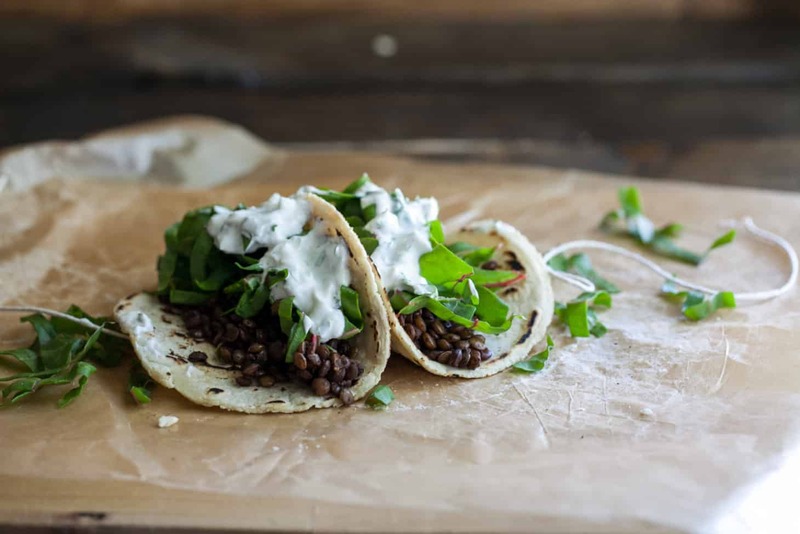 While lentils cook, whisk together yogurt, lime juice, and cilantro. Also, destem chard by folding in half and cutting along the stem, then roughly chop. love lentils, love chard, love tacos. these look absolutely scrumptious and somehow so perfect for late spring!! gorgeous pictures, too! Yummmm that look fabulous! Wearer Mexican tonight but used store bought tortillas, I have always wanted to make my own so thanks for the inspiration and recipe to give it a go! My fave filling is kidney beans cooked with tinned tomatoes, cumin, coriander and smoked paprika or chilli powder. To make it a healthier option, we have recently cut out sour cream and cheese and instead make a nut based ‘sour cream’ tonight was macadamia nuts, but cashews work well too – water, nuts, a bit of lemon or apple cider vinegar all blended into a smooth creamy texture. So yum and so healthy! Can’t go past a delicious guacamole on top! Yum!! I’ve been wanting to experiment with using nuts in replacement for dairy. I’ll have to try that! Yum! I’ll have to try chard stems sometime- your tacos look delicious! These sounds absolutely fabulous. Love this idea! I’m another one who has never really got over the fear of making tortillas, there just seems to be so much potential for it to go badly! I’m inspired by the example from you and Kelsey though; the tortillas look so wonderful. Great meal! I can’t wait to try making corn tortillas! We are on the same wavelength! I just made corn tortillas for the first time a few weeks ago and LOVED it! Great filling for tortillas, beautiful photos! 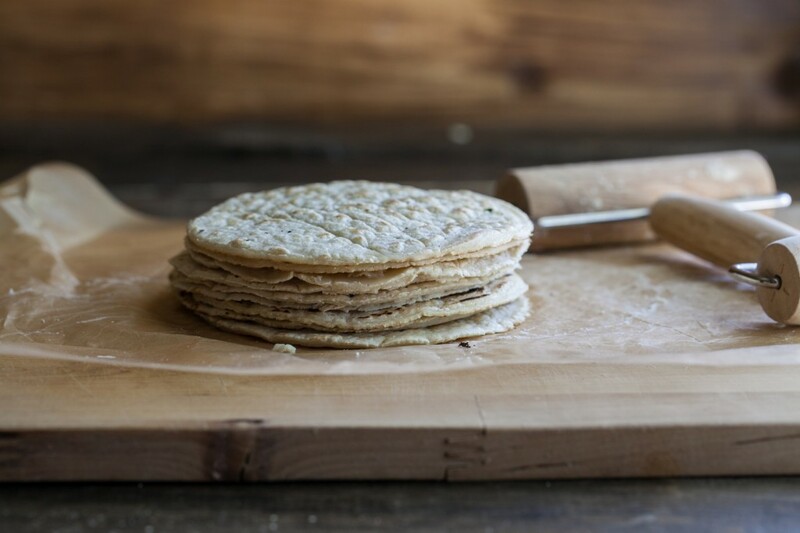 I’ve tried making corn tortillas a few times but I can’t seem to get them thin enough! 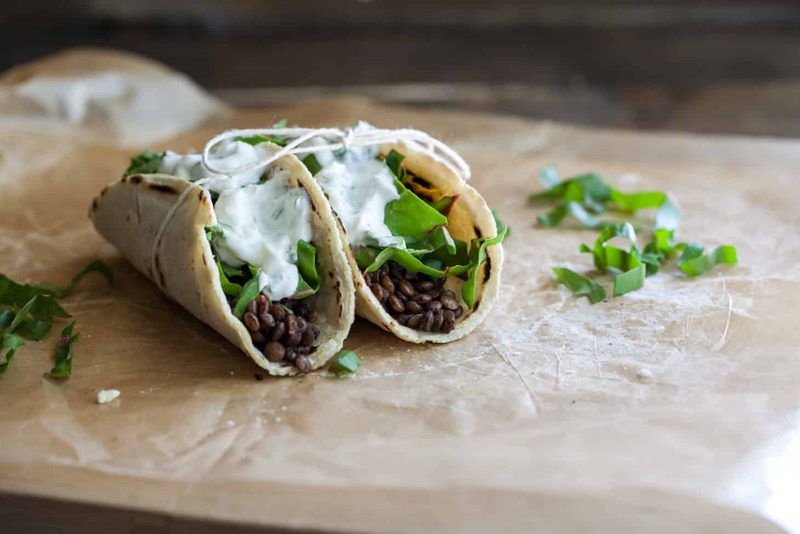 Yours look perfect, and I love the lentil and swiss chard filling idea! Um, Absolutely yes. Times a billion. I saw Kelsey’s post on homemade tortillas too and it is inspiring… Also, I was on a lentil kick and just started thinking that I need a break from lentils… but after seeing this post, I’m having second thoughts now. These tacos look great Erin! 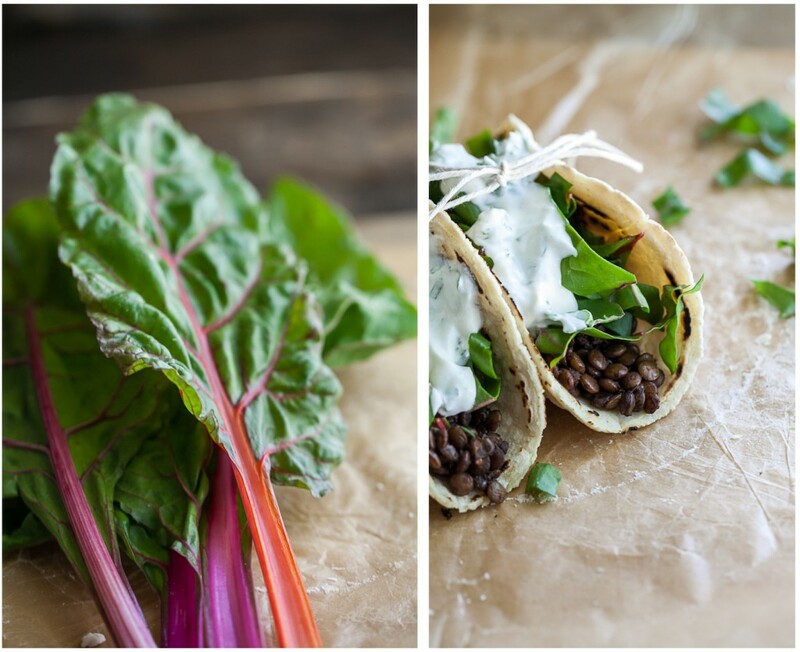 Chard is one of my favorite things to put in tacos–so happy to see it here! I’m also intrigued to see the cocoa powder in your lentil filling. Must try!